"Ginger has lived in seclusion, with only her Aunt Malgarel and her blue cat, Halcyon, to keep her company. Her sheltered, idyllic life is turned upside-down when her home is attacked by messengers from the world of fae. Accompanied by Halcyon (who may or may not be more than just a cat), an irascible wysling named Azrael, and a loyal fire elemental named Salazar, Ginger ventures into the world of fae to bring a ruthless Queen to justice." Mirriam's writing had always fascinated me. From the moment I met her and began to delve into her written worlds, I was drawn in by the way she poured words into the soup pot and came out with something gourmet. Paper Crowns is something unique, however. 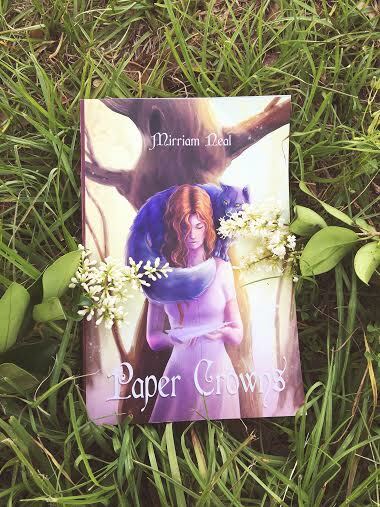 While most of Mirriam's writing is intense, as sharp as the wit of Oscar Wilde and as bright as a firecracker, Paper Crowns has an aura of magic and drowsy dreaming that fit it more into a chimera world of Howl's Moving Castle and Jim Henson's Labyrinth with maybe a tiny touch of Alice in Wonderland. maybe. besides, there is a talking blue cat. trust me, you want this. With the assortment of characters, the whimsy storytelling and the drifting in and out of the fae world and back into ours, the 191 pages of Paper Crowns is a fast read that will make you be glad it happened but sad its over. Today, for your reading pleasure, I have two very special surprises. Oh I know, don't thank me yet. 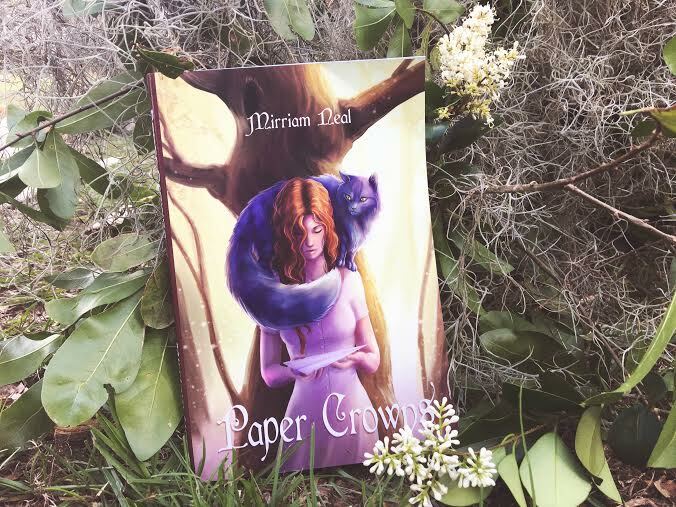 First up, the marvelous author is here, herself, to answer a few questions about Paper Crowns and its construction. Unlikely Things: "What three songs were at the top of your playlist while writing Paper Crowns?" MN. : "Until The Darkness Comes by Colbie Callait, Magnetic by Jessie J. and Lost Boys by Novelette"
Unlikely Things: "Can you remember what the first 'ah ha!' spark of inspiration was?" MN. 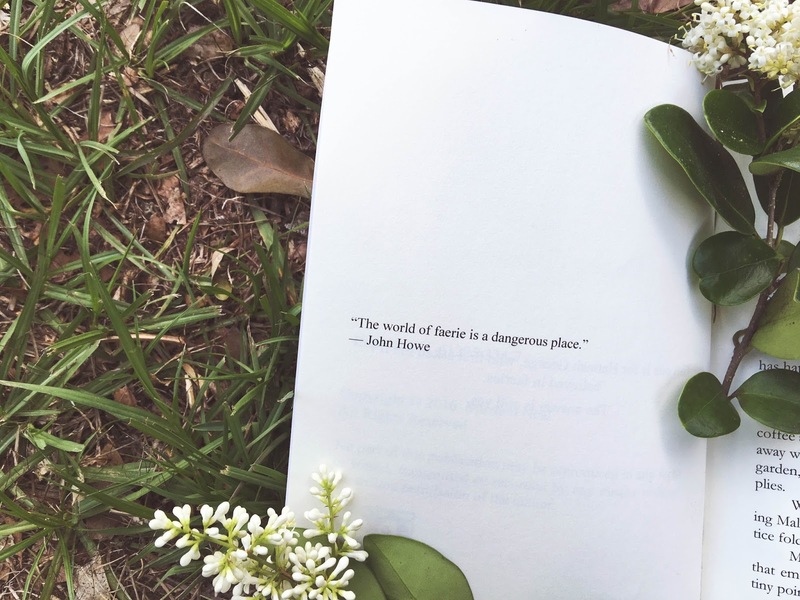 : "When I realized I was well and truly irked by Julie Kagawa's 'Iron Fey' series..."
Unlikely Things: "Can you describe Paper Crowns in five words?" MN. : "Even the muffins are dangerous"
Unlikely Things: "You have a very interesting set of characters within Paper Crowns. Was there any interesting founding-inspiration for any of them?" MN. : "Not necessarily, no. I'd wanted to write a shape shifting cat for a very long time, but I can't recall exactly where that desire came from." Unlikely Things: "What do you hope readers take away from reading this book?" MN. : "This is one of my rare novels where I'm not necessarily writing so readers 'take away' anything but some warm, fuzzy feelings and - hopefully - new characters to love." Unlikely Things: "Is it possible for you to choose one scene that was your favorite? Can you describe it to our readers?" MN. : "I don't necessarily have a favorite, but to pick one from the pile, I really enjoy the scene with the Mattigan. Who and what the Mattigan is, I can't exactly say. ;)"
I had to fight some bees to get the flowers for this picture. It was not enjoyable. Unlikely Things: "What about a favorite quote?" MN. : "Ohh, I can't say a favorite quote. I try to write everything with a quoteable air, if that makes sense. I write things I would want to read, I want to make it all enjoyable." Unlikely Things Note: pretty much everything that spills from Hal and Azrael's mouths is my favorite quote. Which...seeing how they are mouthy and they happen to poke alongside Ginger throughout the majority of the book...I have way too many favorites. yikes. Unlikely Things: "This is your second published book, but your first book that has not been independently published. Why did you decide to go the traditional publishing route with Paper Crowns?" MN. : "Well, technically Indie is a step between self-publishing and traditional. I'm still working towards having a novel published traditionally, and this is the next step towards that goal." Unlikely Things: "Are you sworn to secrecy, or can you tell us a bit about what project(s) you are working on now?" Unlikely Things Note: whatever is lined up for the noose/knife/bullet had better not be another character. I can't emotionally take that. Unlikely Things: "What is your favorite aspect of the Paper Crowns world?" MN. : "I love the back-and-forth between the fae world and ours. Playing mix-and-match is my favorite aspect." Unlikely Things: "Tell us about that cover art! Man, I know they say that you shouldn't judge a book by its cover, but people do. Paper Crowns has some lovely, stunning art, so boast a bit! Tell us how it came to be." MN. : "MY GIRLBRO EXTRAORDINAIRE LAUREN GIFTED IT TO ME. She'd wanted to do the cover for Monster originally, but we didn't know each other well and she didn't say anything about it. So with Paper Crowns, she jumped in, told me she had my back, and gave me a cover more gorgeous than I ever dreamed of"
Mirriam Neal is absolutely beautiful and is sickenly talented. But why take my word for it? Thats right, its a giveaway! The rules are simple: follow the rules in the rafflecopter, and on Wednesday, June 1, the winner will be contacted to receive their address in order to have the paperback copy mailed to them. It's going to be worthwhile, trust me. Want to read more about Paper Crowns and visit more blogs hosting author/book spotlights, reviews and more? Here is a list of blogs and posts to check out! Want to enter to win a signed copy of Paper Hearts? do so here. An entire, complete list of all the locations and dates that the Paper Crowns tour will be headed is available here. Keep an eye out for more goodies and fun! Love the interview! Wasn't what I was expecting, but that's a good thing! It was very interesting. I'm fond of cats in all varieties so a talking cat I'm sure to love. I prefer my muffins to be safe, and not dangerous, I'd rather not die by a muffin stuck in my throat. And as for wizards, well we all know they arrive precisely when they intend to, so that's my question (as I've yet to read this book) when does the wizard arrive? Very fun interview!!! So excited abour Paper Crowns!!! Ashley, your writing style is adorable! And I'm quite impressed by this interview. I loved your questions and Mirriam's answers are always spot-on. I really don't think muffins should be dangerous, simply enjoyed... But I don't know. ;) Maybe there are times for muffins to be defensive. I like sass, so I think that wizards would do well to be sassy... I love the sass of characters in Mirriam's writing, and can't wait to read this book!! Love this book, and everything Miriam writes. Paper Crowns is one of my favorites, mostly because of Azrael.